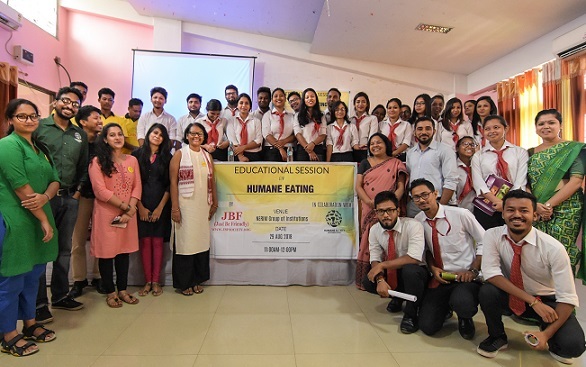 An educational programme on “Humane eating and veg outreach” was launched on Wednesday by JBF (Just Be Friendly) in collaboration with HSI (Humane Society International). It was organized at NERIM Group of Institution premises. The aim of this programme was to create awareness about animal cruelty with a motive to reduce consumption of animal products and replace them with non-animal alternatives. An idea of Meatless Monday was also initiated in the programme where one can stop consuming meat for a day to stop a little cruelty towards animal and embrace a healthy lifestyle as well. The programme was attended by Dr Smriti Rekha Dutta, Programme Director of JBF, Swagata Hazarika HOD, Department of Social Work, NERIM, students of MSW department other faculties of NERIM and members of JBF. JBF will be doing this educational programme throughout this year in different colleges and institutions in Assam.